I know that is music is divisive (to say the least), but I really, really like it. "Lose Yourself" is a masterpiece, "Stan" is an incredible work of narrative poetry (and gave us a new term for an obsesses fan) and "The Real Slim Shady" is a classic. I saw him in concert back in '09 and it was fantastic! It was after he got clean and all that, and he was great! Anyone else a fan of him? Not a fan per se, but Till I Collapse is a running mantra for me and I always play it during a tough workout or as part of my playlist to pump me up before a race. Till I Collapse is an amazing workout song. It gets me so pumped! I'm not sure where he is on the scale of homophobia (uses the f word in a lot of songs, also supposedly good friends with elton john??) but he knows how to write an excellent song. I think 8 Mile's really good too! He should be in more movies. I think you're talking about Hailie's Song, which is a pretty sweet song. I remember way back in the day my friend burned me a mix CD that had it on there and I loved it. I can't deny his talent, or how much I listened to all his albums. I know some of his lyrics were misogynistic and homophobic, but there was a lot of genius in there as well. Now that he's sobered up and settled down, I see him as a man that has grown a lot. I believe he's raising his daughter on his own, and taken in a family member and at one point Kim's (his ex-wife) child. 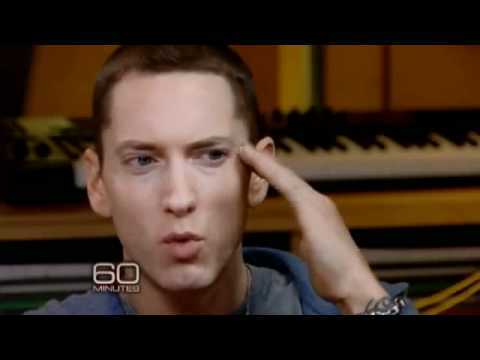 I think had the Eminem persona of the early days lived on, he would have ruined his long term repuatain. I think Eminem is a brilliant songwriter, honestly. I don't always agree with them, but I love some of his music. I have a lot of respect for him, especially once I saw the piece 60 minutes did on him, gosh, 3 or so years ago? Its a really interesting look into his background and his music. @SarahBeth that's a great interview! I really liked learning about how he writes; it's interesting to have insight into his process particularly because what I admire about him is the way he fits rhymes together. Especially the way he uses internal rhyme, which I find really hard to do. @TravelingDesign I agree that it seems he's calmed down in the past few years. I think it's a good thing; it'd be hard to keep up the Slim Shady persona when you're a 40 something year old guy. Also, if you all haven't seen Kelly Clarkson rapping Lose Yourself, you're missing out. I love her, lol. Not really Eminem direct, but its indirectly related. @Sadie, isn't it interesting? I go back and watch it every so often just because I think its such a fantastic interview and insight into Eminem's background and songwriting. I also appreciate that he basically tells parents to parent and be responsible for what they listen to and it's not HIS responsibility to make sure other people's kids aren't exposed to bad language or whatever. @SarahBeth Kelly Clarkson's great! I'm glad she got out from under the American Idol stigma and became successful. Her cover's pretty good, but it also emphasizes that Lose Yourself is REALLY hard to rap/sing. There's so many words! And I did really like the fact that he addresses people who blame him for their kids acting up or whatever. He's an artist, like his music or not, and he's not responsible for other people's kids. It really pissed me off when people were blaming him or Marilyn Manson for inciting school shootings because that's a totally specious and vacuous argument. It's much easier to blame something you have no control over, rather than take a look at yourself and try to make changes. He kind of talks about this in his song "White America" which I love, and it is pretty sociopolitical (as political as Eminem gets anyway) about how no one would've looked at his lyrics twice if he weren't white. The Marshall Mathers LP came out when I was 13, and I was obsessed with it and his first album for a year or two (I went straight from N*Sync to Eminem). I also enjoyed his next two albums. I am glad that he has been able to get clean, but his last few releases haven't done much for me. I know part of it is me being older, but I also don't think he has grown much - his shtick is basically the same as it was 15 years ago. (I think this article is a really excellent articulation of my point.) Still, though, The Marshall Mathers LP is one of my favorite albums of all time, even if parts of it seem more questionable now that I'm an adult. @harlowish I know what you mean about his shtick, and in some ways he is kind of a relic from the heady days of the early aughts. I was a little younger than you when MMLP came out and that album and the subsequent The Eminem Show were inescapable so I'm not sure if my continued listening to him is due in part or all to nostalgia, but I do admire his talent. And I like some of the songs from his most recent album The Marshall Mathers LP2 including the sequel he wrote to "Stan", "Bad Guy". I could do with less of the women hating, though. It's old news, and at this point, it seems a little aimless. I don't like the song "Kim", but it was uncomfortably personal and kind of a glimpse into his psyche. Now it's just misdirected. But in any case, I find him fascinating and his music (even some of the more recent stuff) to be pretty unassailable.